If we receive a notification that we were unable to deliver a message we will mark the member as unreachable in your group member list and the failure to deliver will also appear in the delivery report for that message. As well as showing the member to be unreachable we will display all the information we have about the failure. 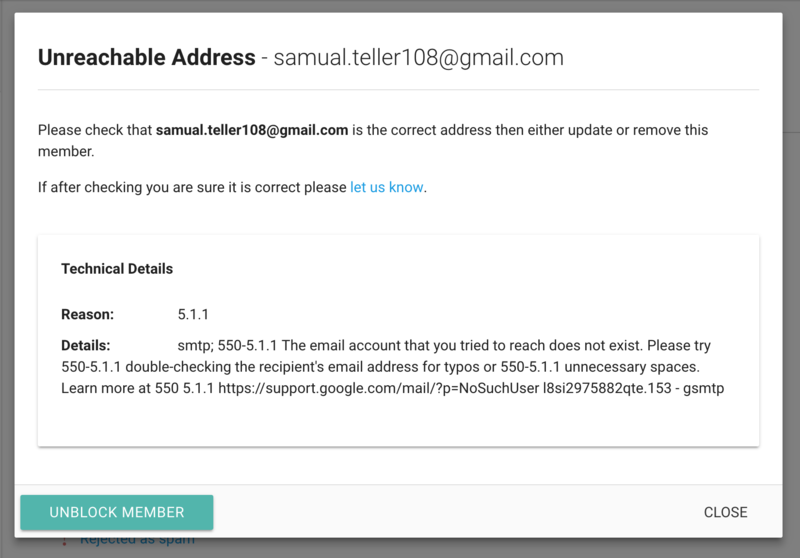 This means that the email address is no longer recognised by the email provider, in this case, it’s best to check with the recipient that you have their latest email address. The other reason for receiving a delivery failure notification would usually be that the message has been rejected because it was (incorrectly) identified as spam. The best way to deal with this is to have the recipient add your group address (i.e. monday-bookclub@gaggle.email) to their contacts. To help with this we have a WhiteListing Tool which sends the recipient instructions on how to do this for various different email clients.